How do you intrigue new clients and veteran clients into repeatedly patronizing your business over your competition? Turn your business into an "experience" to make your business unforgettable. Your current and future clients will brag about your business to all their friends, family, and social media platforms! You can get clients walking through your doors with a well designed space with well crafted photos of your business on several social media platforms! The more excited you get about YOUR business...the more excited your current & future clients will become! One way to create ambiance that is unforgettable...use your vertical wall space! In most well designed spaces, wall space is NOT an afterthought. It can set the tone, ambiance, and "experience" for your business. How do you keep your walls looking professional, uncluttered, & well designed? It’s a fine art but one that needs to be done to make a great impression. A paint treatment can often be the most affordable way to completely change your store design. Do you have tall ceilings and don’t know what to do with the space? Do you want your space to look more intimate? Cut your colors in half! Do you have a big wall but don’t want to clutter with photos? Make yourself a mural with tape & paint! Do you want to showcase photos in a well designed way? I’ve posted some inspiration pics found online that will give you ideas to solve these common store design challenges. Although most of these ideas are residential, they easily convert for commercial application. Leel Michelle is the owner and designer behind the award-winning pet groomer apparel brand, Retro Stylist Wear and the grooming salon and boutique; Bow Wow Beauty Shoppe. She is a San Diego native that has also called Los Angeles, New York and Italy home. Formal education in fine art, art history, and fashion design led this animal loving entrepreneur to bring all her passion, talents and knowledge together to create a memorable and beloved retro business for pets and their owners. In 2006, following 2 previous careers in corporate retail, and corporate amusement park management, Leel graduated pet grooming school to create and manage an award-winning pet grooming salon and pet boutique. Leel has also grown the Bow Wow Beauty Shoppe brand to include custom luxury kennels and product lines in production to help the average small business groomer and pet retailer by improving their pet retail merchandising. Most days you will find Leel Michelle at her shoppe, with her family, or at a trade show making the world more Fabulous-one smile & smock at a time! 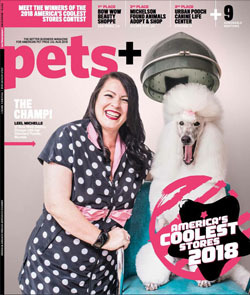 Bow Wow Beauty Shoppe - San Diego - Wins 1st Place "America's Coolest Store 2018"